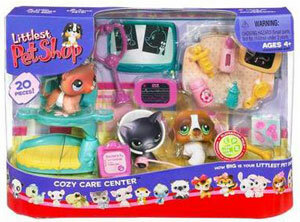 Description Of Item: Help all of your pets stay happy and healthy in the COZY CARE CENTER pet playset! With 20 fun get-better accessories, you?ll have everything you need to give your pets a good check-up! Try Bandaging their boo-boos, ?feeding? them their medicine, and even turn the x-ray table into a cozy bed for ?sick? pets to get their rest!